The Capital Grille is one of the best, if not the best, restaurants in Charlotte. And it just happens to be home to the best steak I've ever eaten. After years of hearing how special the restaurant is, and how fantastic the food is from my dad, I got to finally experience it for myself, prior to a Charlotte Hornets game. It surpassed my expectations. The atmosphere is as if you're in a study or a library, dimly lit, with dark wooden booths and tables. (Apologies for the dark photos!) Our server took special care of us, as it was my parents' anniversary! It couldn't have been a better evening. My favorite special occasion drink is a Ketel One dirty martini with blue cheese-stuffed olives. Naturally, dinner at the Capital Grille is a special occasion. 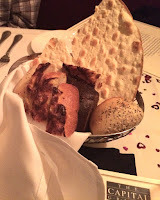 I sipped on my martini as I indulged in the bread basket, featuring pumpernickle with golden raisins and walnuts; onion ciabatta; sesame and poppy seed rolls; and a tall salty cracker sticking out the top. For the record, I tried them all, and my favorite was the pumpernickle. Or the onion ciabatta. It's too close to call - it's best we got to try them all. An amuse bouche is an indicator that you're in a special place. Very few restaurants in the Triad do this, so I was tickled when a spoonful of crab salad appeared atop a slice of cucumber, topped with green onion and drizzled with sesame oil. It was a fabulous and fresh appetite whetter. Any of the Capital Grille's steaks can be topped or encrusted with any of their unique and varied crusts. I had the Filet topped with their Gorgonzola and Truffle crust. This was the best steak of my life. The steak was beautifully medium rare and tender, and the crust adds a salty richness - it's literally perfection. The special that evening was a bone-in Filet, which was decidedly more tender, but I thought my crust really killed the competition. The bone-in Filet special was served with a South African Lobster tail, which was cut tableside and served as a centerpiece! The lobster was incredibly sweet and decadent. Drizzle it with the melted butter bowl they bring, and sprinkle it with salt - it doesn't get any better. 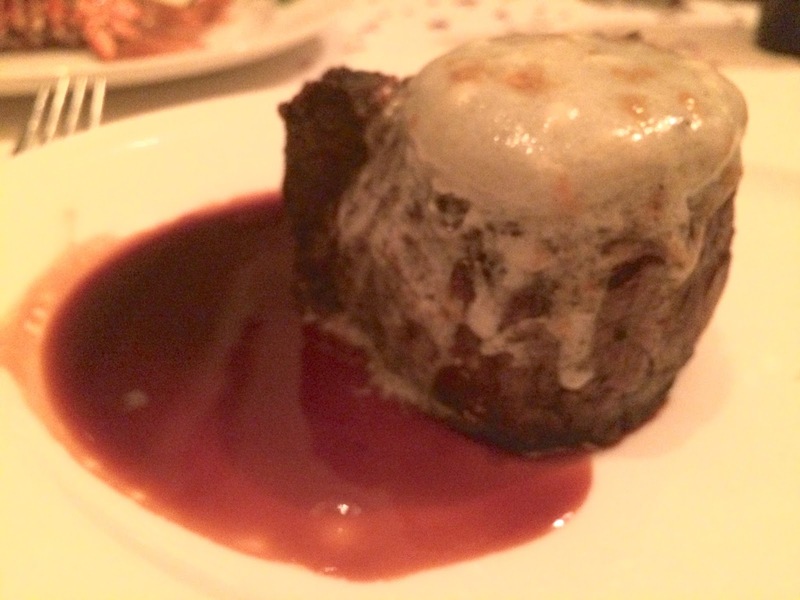 This filet with gorgonzola/truffle crust. I'm really not sure I can even. Forget what you think you know about Brussels Sprouts. The Capital Grille's are outstanding. They're fork tender, and I'm not sure that I'll ever find them done better. The chef adds chunks of smoky bacon for added flavor and to further prove that his are the best. 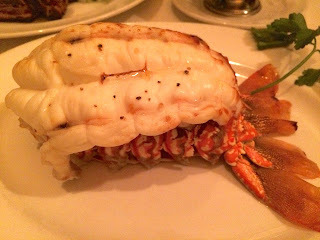 This giant South African lobster tail was a gorgeous centerpiece before we devoured it. It would be in your favor to save room for dessert, though I much preferred the Cheesecake to the Flourless Chocolate Espresso Cake. If you like fudgey, dense, coffee-flavored desserts, you will adore that one. However, I stole several bites of the cheesecake, made with cream cheese and ricotta, the latter adding a really nice, almost savory tang. The cheesecake is smooth and sits atop a Vanilla Wafer crust, and the top is bruleed, to make it even more luxurious. Berries are a nice pop of color. If you find yourself in Charlotte for a show, a game, or just for fun (and lucky you! 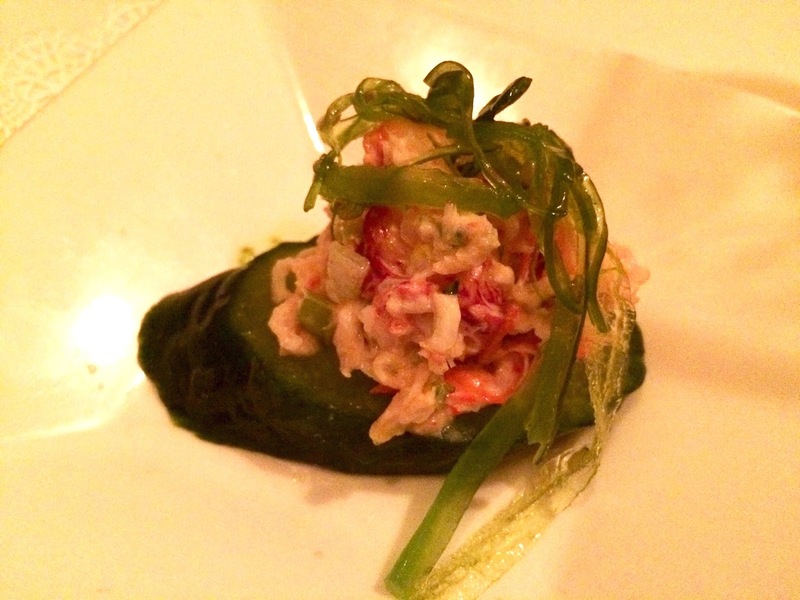 ), you should check out The Capital Grille. You actually can find more affordable options on the menu, especially if you dine at their stunning bar, but regardless, this place is worth the splurge.